MOTOR OPTIONS F25 | F30 | F40 | F50 | F60 | F70 Minn Kota® 45 Edge™ provides quiet, dependable power Marine grade, pressure treated floors & decks with limited lifetime warranty Garmin® Striker™ 4 color fishfinder with GPS waypoint marking is standard Lockable bow storage 10" x 23", 10 gallon aerated livewell with timer. Cushioned lid provides seat for third angler Lockable rod storage with rod tubes protects your gear Large lockable storage helps eliminate clutter Skid resistant, easy to clean marine grade vinyl Contoured fishing seats swivel and have open storage underneath for easy access while fishing 20 Stick steer is fun to drive, provides good handling in tight fishing spots Command center for driver has easy access to Garmin® Striker™ 4 color GPS fishfinder, 12 volt power outlet & control panel w/master power, bilge, livewell & nav light switches. Aerated livewell with timer has a 500 GPH pump, overflow and a quick release drain plug. Lid is cushioned to provide a third passenger seat. 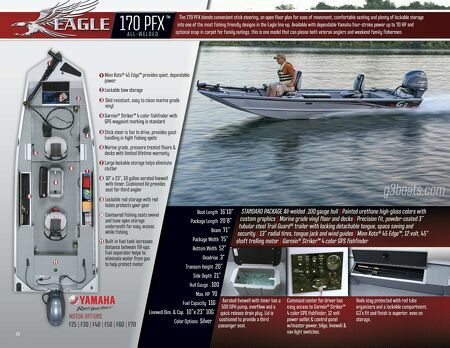 Boat Length 16'10" Package Length 20'8" Beam 71" Package Width 75" Bottom Widt h 52" Deadrise 3° Transom Height 20" Side Depth 21" Hull Gauge .100 Max. HP 70 Fuel Capacity 11G Livewell Dim. & Cap. 10"x 23" 10G Color Options Silver STANDARD PACKAGE All-welded .100 gauge hull | Painted urethane high-gloss colors with custom graphics | Marine grade vinyl floor and decks | Precision fit, powder-coated 3" tubular steel Trail Guard® trailer with locking detachable tongue, space saving and security | 13" radial tires, tongue jack and wind guides | Minn Kota® 45 Edge™, 12 volt, 45" shaft trolling motor | Garmin® Striker™ 4 color GPS fishfinder 1 1 2 2 3 3 4 4 5 5 6 6 7 7 8 8 9 9 10 10 The 170 PFX blends convenient stick steering, an open floor plan for ease of movement, comfortable seating and plenty of lockable storage into one of the most fishing friendly designs in the Eagle line-up. 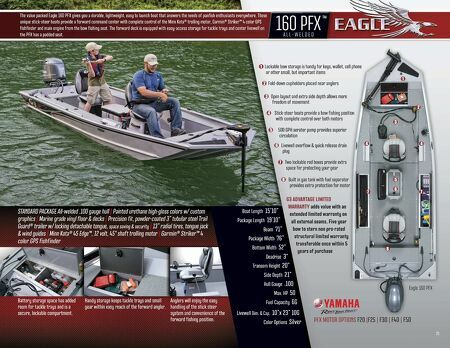 Available with dependable Yamaha four-stroke power up to 70 HP and optional snap-in carpet for family outings, this is one model that can please both veteran anglers and weekend family fishermen. g3boats.com Built-in fuel tank increases distance between fill-ups. Fuel separator helps to eliminate water from gas to help protect motor 11 11 Rods stay protected with rod tube organizers and a lockable compartment. G3's fit and finish is superior, even on storage.